“And where are you from?” It is usually the first thing that comes out of anybody’s mouth as they are meeting someone new in Alaska, and all along the Alaska Highway, for that matter. It seems that everybody there is from somewhere else. Oklahoma, Ontario, Florida, Washington, California, Ukraine, Bulgaria. We met people from all over the world. But we only saw a few native Americans – or First Nation – as they are called in Alaska. 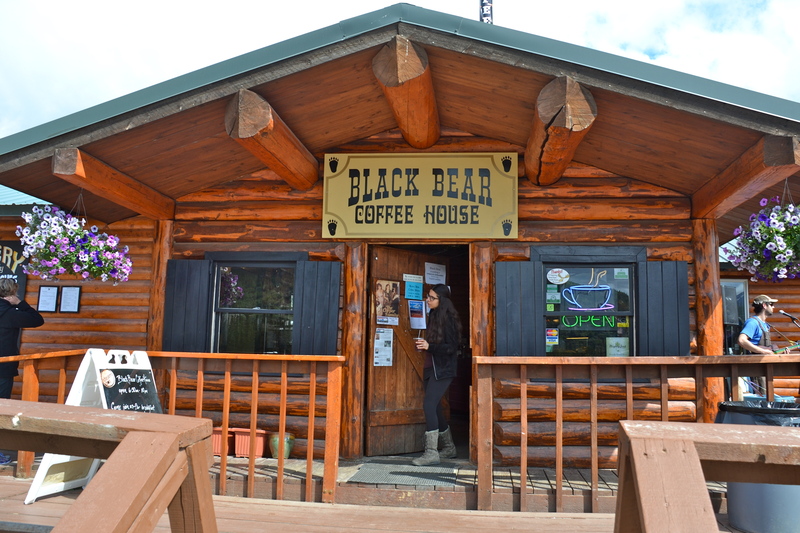 Wendi is a shift manager at the popular Black Bear Coffee House on the boardwalk. Our destination in Alaska was the Denali area because our daughter and son-in-law have lived and worked there every summer for the last nine years. 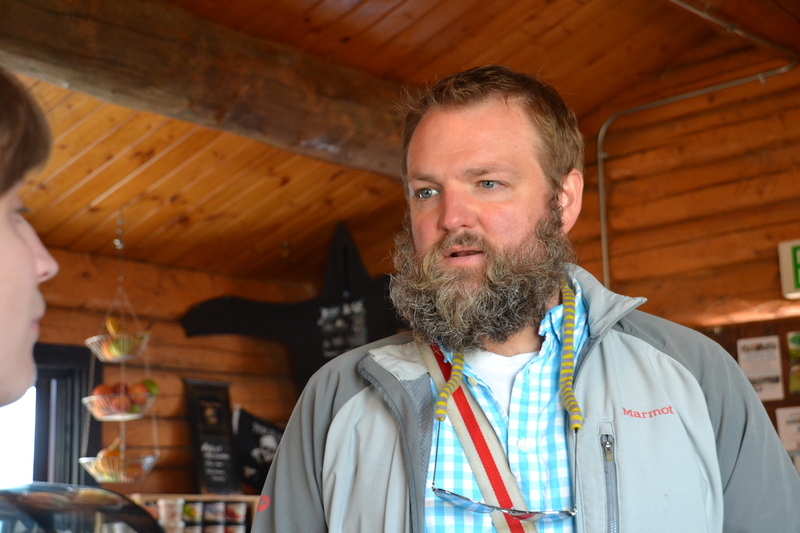 Wendi is a barista and shift manager at the popular Black Bear Coffee House, and Scott runs their adventure outfitter, Denali Adventure Tours. The two shops are located on the boardwalk in McKinley Park about 200 feet apart with about ten shops between the two. Scott and Wendi own Denali Adventure Tours and supply the tourists with adventure trips from whitewater rafting to fly-overs of McKinley. Rainbow Village, the RV park where we stayed, was right behind the row of shops, a virtual parking lot with utility hookups. It was really handy to the back doors of the shops and helped us to see the back story of the lives of the seasonal workers, an intriguing sub-culture. 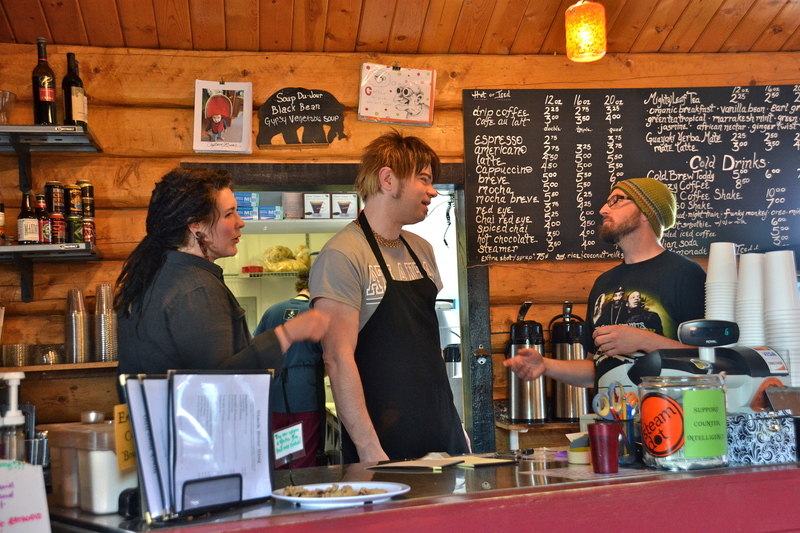 These young seasonal workers at the coffee house are all from somewhere in the lower 48 states. The village completely shuts down in the wintertime, so everybody has to go somewhere else. Many of the workers get seasonal jobs elsewhere in the country, or like Scott, they are students or teachers at universities. Wendi gets a temp job where they live in California during the winter. One of the pilots at Denali Air flies shuttles in the Philippines every winter, so he works the tourist industry in two hemispheres. Pilot Bob flies tourists over Denali in the summer – and over the ocean in the Philippines during the winter. 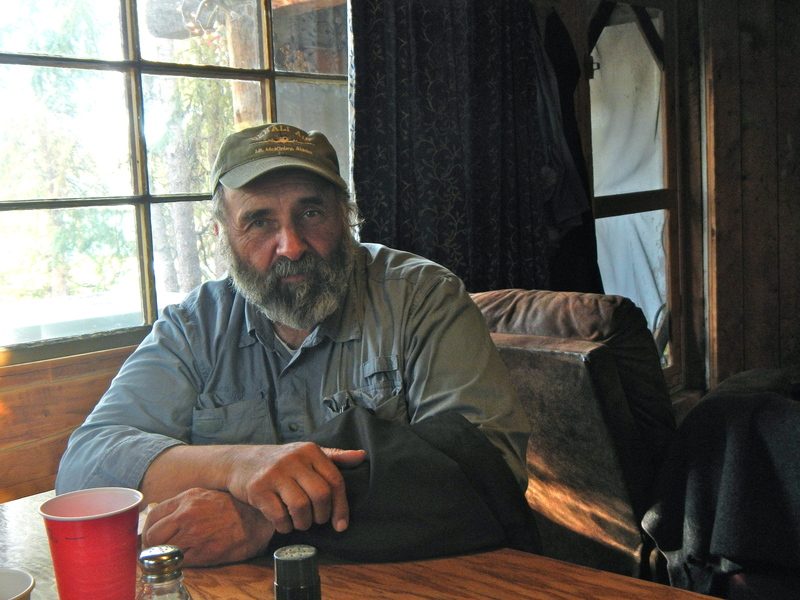 It was fun for us to stay at Denali for more than five weeks so we had time to get acquainted with Scott and Wendi’s friends and learn a bit about their lives at both ends, the summer at Denali and the other three seasons somewhere else in the world. 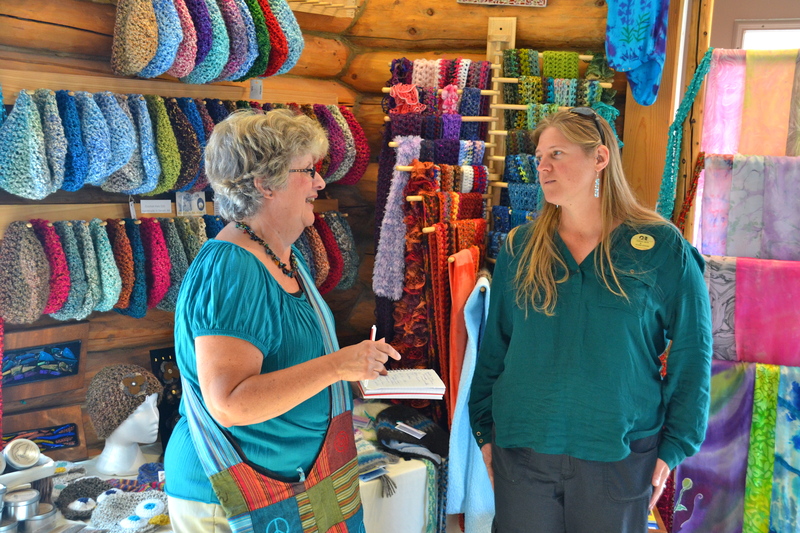 Kaye talks with Michelle, a shop owner from Ontario, about how she ended up in Alaska. It’s a transient life for those guys, and I think we understand it a lot more now that we have lived on the road for the last seven months, covering 10,000 miles of contrasting geography from the Great Plains to the deserts of the Southwest to mountains of the west coast and western Canada. Waking up every morning we have to look around and see where we are to get a sense of location. The seasonal workers must have to often think about where they are at the dawn of every new day. It’s an interesting way to live. We loved getting behind the scenes while we were there. 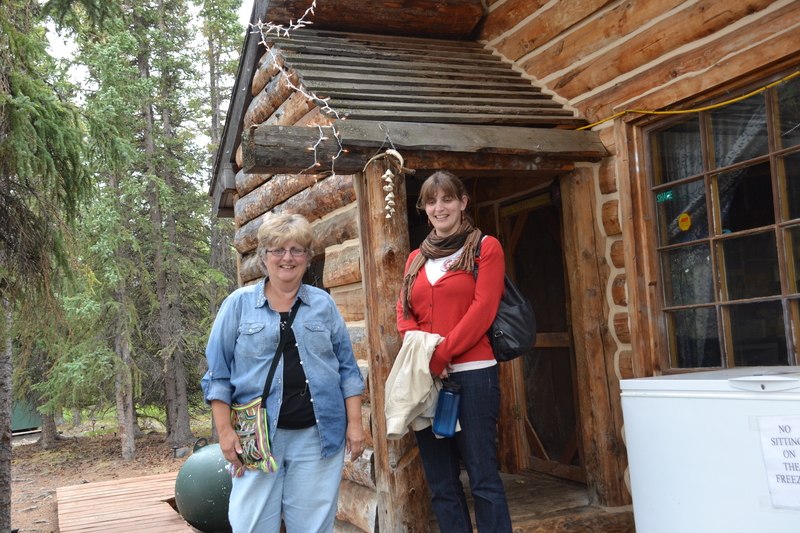 Scott and Wendi live in a 10’x12′ dry cabin in the forest during their summers in Alaska. 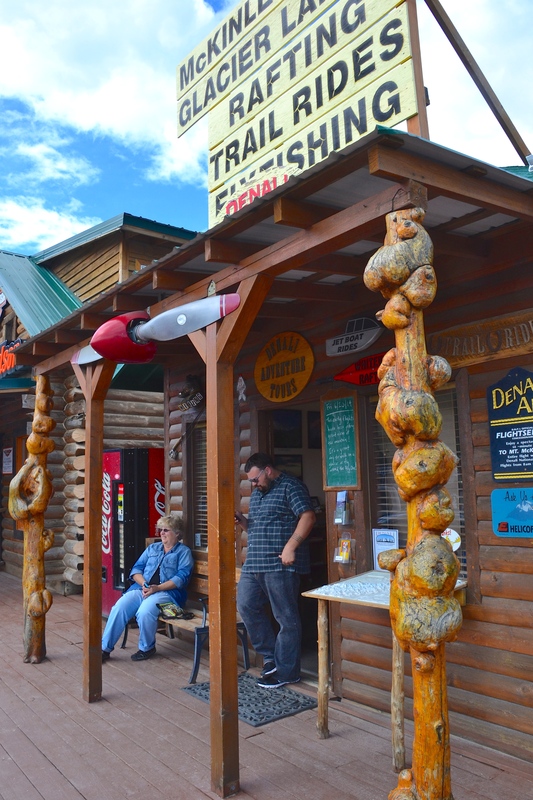 Head space and elbow room are limited in the little cabins. 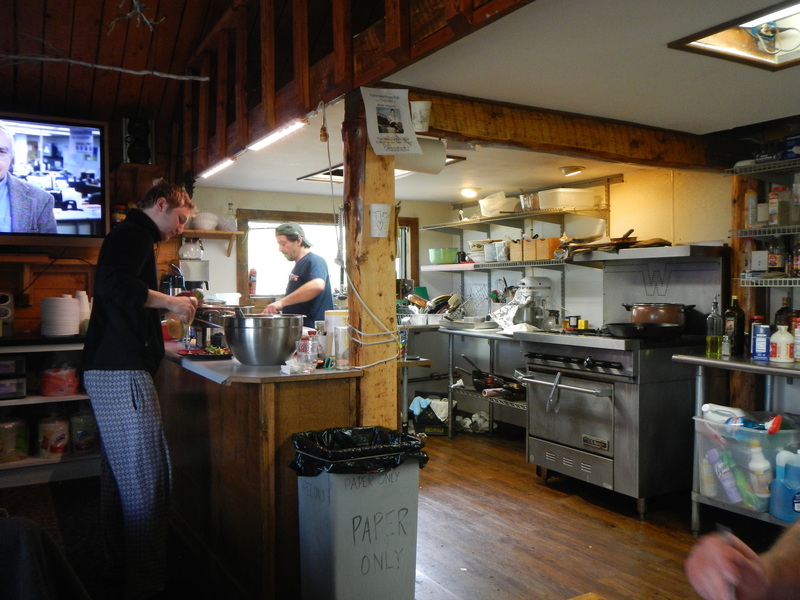 The workers come to the “cook shack” for their meals which are prepared by a hired chef. Bijan makes sure everybody is well-fed with bountiful balanced meals. Keith is a performer at one of the dinner theaters (the beard is part of his stage persona)… and he’s a salesman at a gift shop during the day. He’s from Washington D.C. 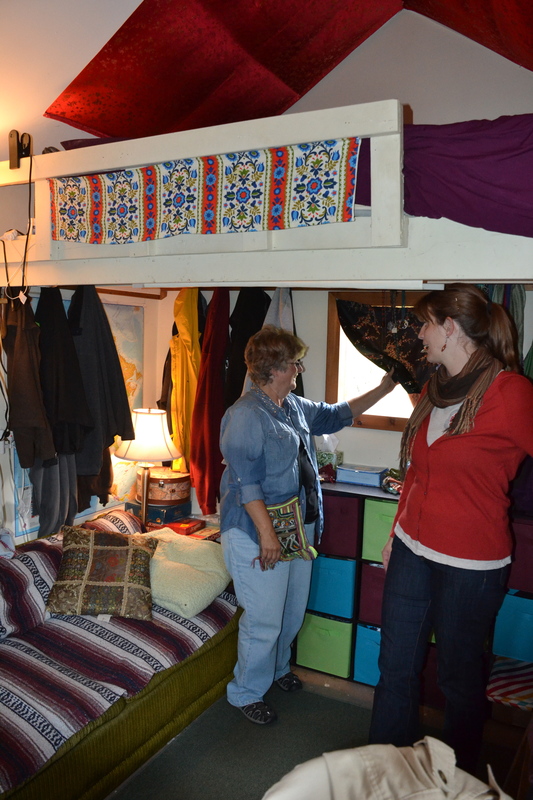 These performers share small bunk rooms with common restrooms… down the hall or out in back. 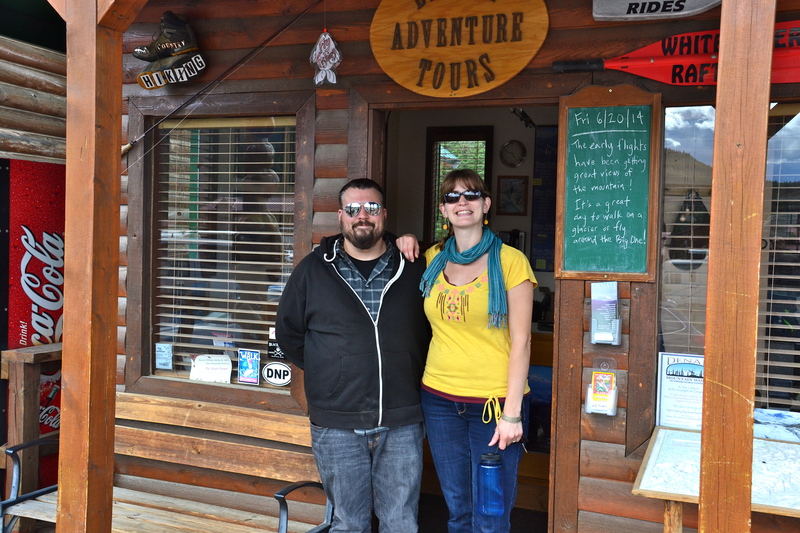 Shop owners Andrea and Brandon are from Anchorage and Michigan but now spend their winters in Arizona. Kaye and Scott enjoy the view of McKinley Park and Mt. 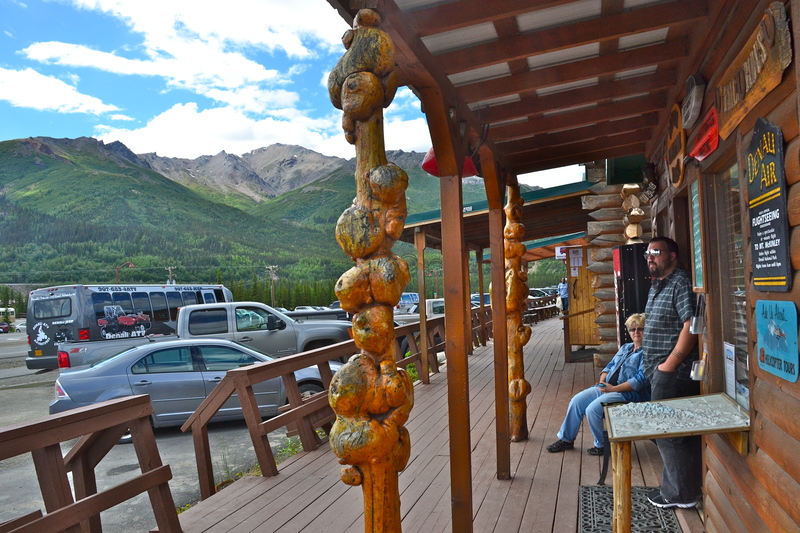 Healy from the front door of Denali Adventure Tours. Get your adventure fix from Scott when you are in the Denali area. So everybody’s from somewhere. 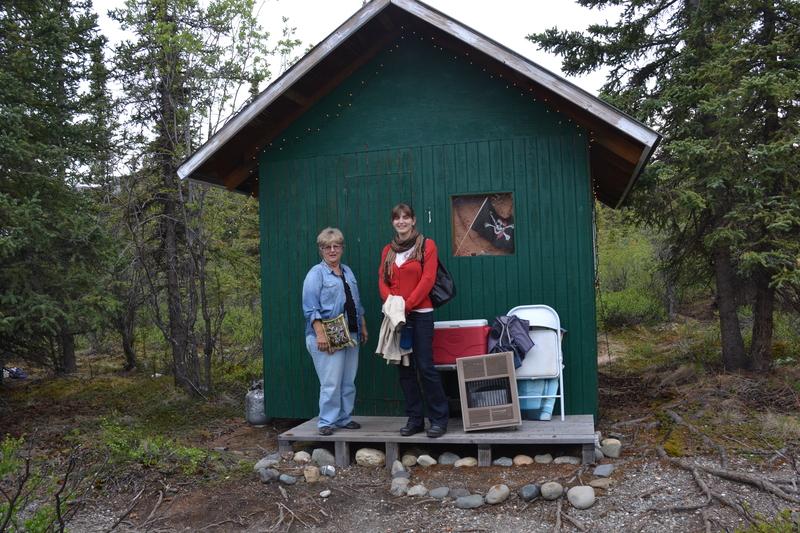 Kaye and I had a great time this summer discovering the back stories on our kids’ friends and fellow workers at McKinley Park near Denali National Park and Preserve.